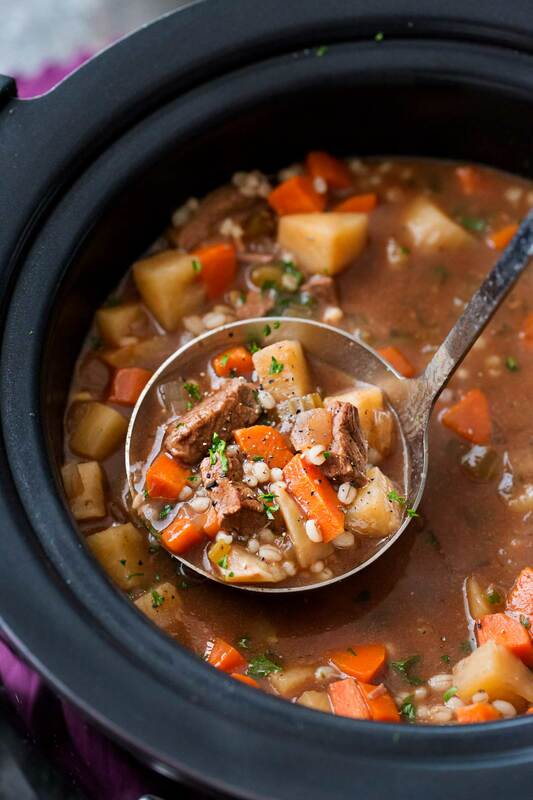 This ultra comforting beef barley soup recipe is made easy in the slow cooker, which makes for incredibly tender beef and vegetables with perfectly textured barley! Have you been under the weather lately, or know someone who is? I’m telling you, the germs are in full effect here in Ohio! I just got over the flu and viral pneumonia, and am now dealing with a nasty case of bacterial bronchitis. And I know a lot of other people going through the same thing. 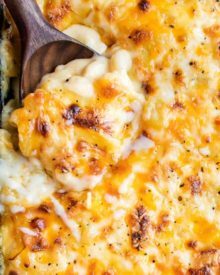 Now’s the time for some SERIOUS comfort food… and this is my all time favorite. Soup is so perfect this time of year, whether you’re sick or not. Especially slow cooker soups, since there’s not a lot of hands-on cooking time! 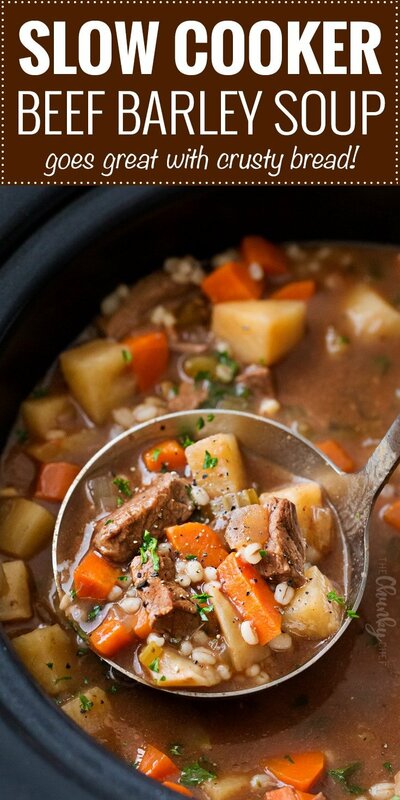 As I mentioned, beef barley soup is my favorite soup… ever! Despite loving it so much, for the longest time, I never made it at home. I was perfectly happy opening a can. But now that I’ve been working on and perfecting this recipe… I’ll never have canned beef barley soup again! WHAT IS THE BEST MEAT FOR SOUP? 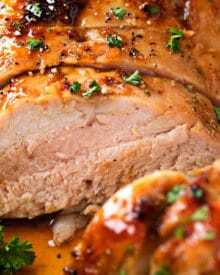 Since this soup cooks for a long time in the slow cooker, a tougher cut of meat is usually used. I like to use chuck roast or chuck shoulder. 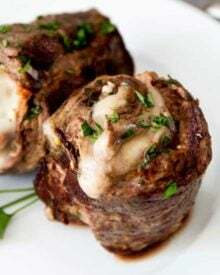 The low and slow simmer will turn these marbled cuts of beef into incredibly tender bites of meat that can be literally cut apart with a spoon. Barley is such an underused grain. It’s texture is chewy with an almost nutty flavor, and it cooks perfectly in the slow cooker. CAN YOU FREEZE BEEF BARLEY SOUP? Yep! Since this soup doesn’t contain any dairy, it freezes beautifully. Cool the soup completely (or any leftovers), then transfer to an airtight container and freeze for up to 3 months. 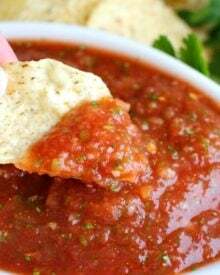 To thaw it out, place it in the refrigerator the night before you want to eat it, and reheat it in a saucepan on the stovetop. Use a tough cut of meat. Like I talked about earlier, this is a prime example of when to use a tougher cut of meat like a chuck roast or shoulder. No need to buy expensive sirloin tips or anything. Prefer a different meat? Go for it! This soup can be made with ground beef if you’d prefer. Just fully brown and drain the beef before adding all the ingredients to the slow cooker. Potatoes are optional. I always prefer some buttery potatoes in my soup, so I added them here… but if you’d rather not add them, no worries, the soup will still taste amazing! In fact, feel free to switch up the veggies to ones that you love. Mushrooms are a lovely addition as well! Browning the beef adds flavor but isn’t absolutely essential. I love to brown my beef pieces, since I love that extra deep flavor it adds… but I’ve made this several times without taking that extra step, and it still tastes delicious. 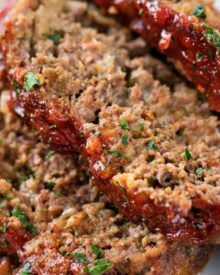 Slow cooker with aluminum insert – I LOVE using a slow cooker like this, since you can brown the beef in the slow cooker without losing any of those browned bits of flavor! More economical slow cooker – This slow cooker has been a workhorse for me, and at the price, you can’t beat it! Plastic cutting boards – These are perfect for cutting up the chuck roast so you don’t have the juices running into your wooden cutting board. 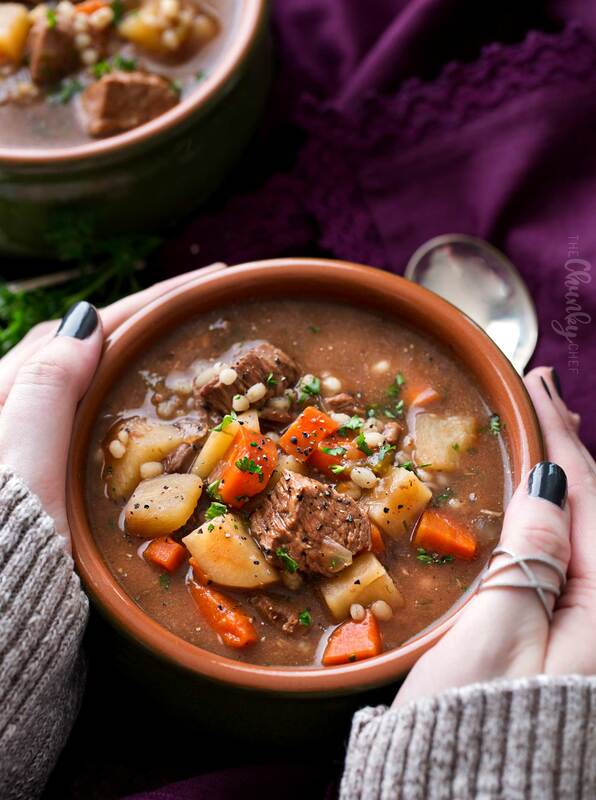 WANT TO TRY THIS BEEF BARLEY SOUP? PIN IT TO YOUR SOUP OR SLOW COOKER BOARD TO SAVE FOR LATER! If desired, heat 1 Tbsp vegetable oil in a large skillet over MED HIGH heat. Add beef cubes and brown for 1-2 minutes per side. Add beef and all remaining ingredients to slow cooker and stir to combine. Cover and cook on LOW for 7-8 hours or on HIGH for 4-5 hours. Remove bay leaves and thyme stems and serve. Goes perfectly with some crusty bread. I added fresh minced rosemary and about another half cup of the low sodium beef broth and simmered on low on the stove for about two hours. I added 2/3 cup of frozen peas with about 15 minutes left. It was absolutely delicious and perfect!!! Will a 3 quart crock pot be big enough for this recipe? I think that might be a bit small. Would a large pot on the stove top work instead? I’m thinking the time would have to be adjusted slightly. Nevermind that last reply. I totally forgot about the new slow cooker I had picked up about 2 months ago. Haha. I’m just now getting into cooking. Trying to eat right and all that fun stuff. Beef barely soup was something my grandmother made that I loved as a child. Her recipe had been lost. I’m hoping this is close. So the potatoes are not soggy being in tge crockpot that long. Best beef barley soup I’ve ever made! The Better than Boilion is a must. Gives it a bold beef favor. I also added chopped kale. I am making this soup recipe right now and it smells really delicious. I did double it, and because my husband is a hunter I put half beef and half venison meat. During the winter months I try to make soup every Sunday. This one will for sure be added to my soup collection!! I followed the recipe mostly except added a bit more carrot and celery and garlic. I also didn’t fo 6 cups of stock because I had added the better than bouillon. So I added 6 cups of water instead. I did want it to be too salty. My whole family loved it! Wish I made more, can I just double all the ingredients if I want a double batch? Can I omit the potatoes? My daughter is making this in a large quantity to provide meals to seniors. I know that it says 6-8 servings. What would you estimate this to be in ounces per servings? We got 16 oz containers and want to make sure that we are making enough. Thanks. I haven’t measured it exactly, but I would guess anywhere between 8-16 ounces per serving. In the recipe, right below the recipe name, there’s a green box that says how many servings each recipe makes. This recipe makes 6-8 servings. What size of a crockpot do you use? I used my 4 quart, so anything 4 quarts or more will work just fine. 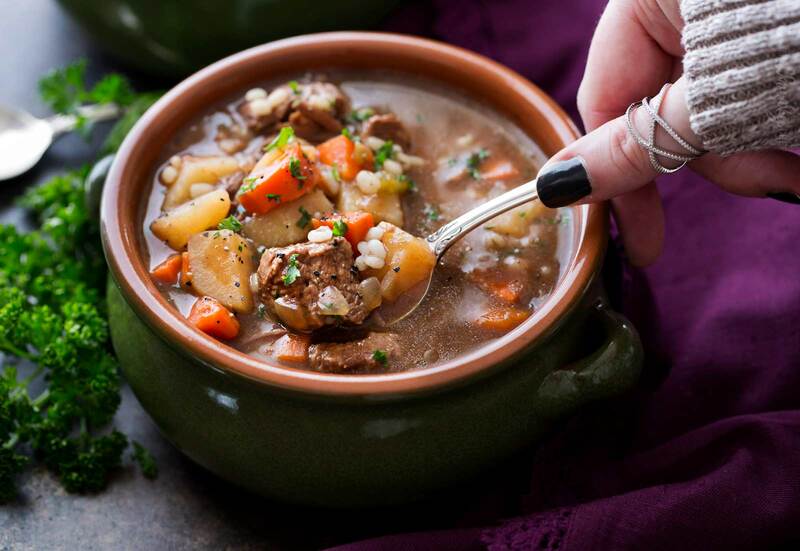 This sounds yummy for a rainy day here in Calif. Question–can I use stew meat already cut up from the market. For some reason here pot roast is so expensive here. Thanks again. Can’t wait to make. Have you tried making this in an insta-pot? If so how long and at what temp. 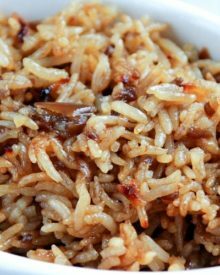 My wife made it in our slow cooker and it was delicious and my picky eater kids loved it too. 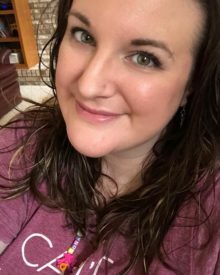 I haven’t tested it personally, but I know another reader (Karen Flores-Perez) has commented saying that she made it in her electric pressure cooker… maybe you could comment on her comment and see if she’ll share her process? 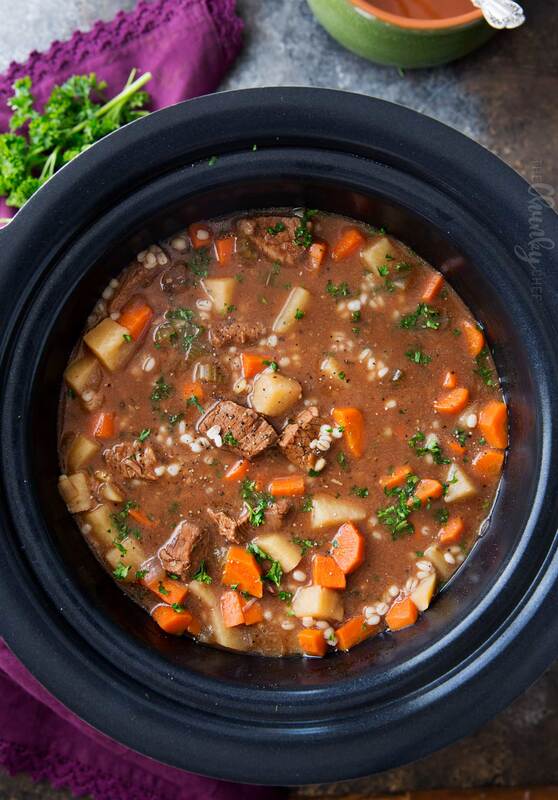 So glad you all loved this slow cooker version! We did it in the Instant Pot for 90mins and then let it cool naturally. We added 1/2cup of red wine and browned the meat and veggies as well. We bought 10min. Quick barley from Trader Joe’s as well and did that after the 90mins. We used boneless short ribs too! I wish I had made a double batch! Seriously, this recipe is fantastic. The only thing I added was a splash of red wine because the bottle was already open. Enjoying it as we speak! (the soup, not the wine). I made this soup last night on a whim for under $10 and under 30 minutes using an electric pressure cooker! I recently had a cup at a restaurant and I was inspired to find out how it was made cause it was so good! I didnt have a bay leaf and used dried thyme. I also added chunky mushrooms because my daughter loves them and it turned out delicious! This recipe is a keeper and will share with family and friends. Hi Karen! When you did this in the pressure cooker, did you brown the beef then just throw it all in and set it for 30 minutes? I’d love to actually make this tonight but wasn’t sure how well it would transfer over to my instant pot. Hi, I really love your recipes! On this one…you mention “If desired, heat 1 Tbsp vegetable oil in a large skillet over MED HIGH heat. 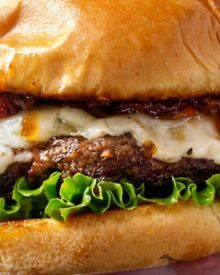 Add beef cubes and brown for 1-2 minutes per side”. So, I’m guessing you can do it without precooking the meat?? How do you do it?? Which way is best? I’m going to do this recipe tomorrow and can’t wait to try it. Hi Lorri! I normally brown the beef first if I have time, but it’s not essential for this recipe if you want to skip that step 🙂 Happy New Year to you as well! Hi! I have a left over brisket my husband smoked that I wanted to use in this soup. Since it is already cooked should I put it in later like half way through the cooking process? Sounds like a great recipe but the only concern I have is putting the vegetables in crockpot for 7 hours….aren’t they too mushy. I usually simmer meat much longer than the veggies. They’re definitely tender, which is how we like them, but feel free to add them whenever you’d like. 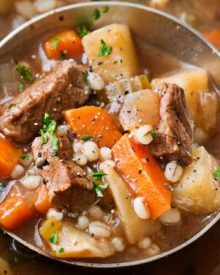 This is the best beef and barley soup, i ever had! OMG! I am making this soup now. Smells amazing! I have been using Better than Bouillon for a couple of years now. I won’t use anything else. I added more meat, potatoes, carrots and liquid. I wanted a larger batch. Just tasted it. Best soup ever! Thank you. I have Quick pearled barley is that OK to use in the crockpot for the soup ? Thank you. I haven’t tested it with quick barley… but I would assume it would take much less time to cook the barley. Maybe add it the last 20-30 minutes of cooking? Hello, I was just wondering if I put the 2 Tbsp of better than bouillon and the 6 cups beef broth or stock? Yes, you add them both 🙂 The better than bouillon just really depends the beef flavor of the stock/broth. I take it this recipe does not use soup noodles? All I have is dried thyme. How much should I use? 1 teaspoon? or maybe 1 1/2? also can you leave out the bay leaves? its just not something I use that much. This soup is perfection! My husband said it’s the best beef barley he’s ever had. Thank you. Thank you for sharing! Can you substitute anything for the beef bouillon? Would beef broth work instead? Hi Amanda…! i love soup and these beef barley soup looks soooo yummy and delicious, i will trying to making this soup in upcoming few days. Thanks for sharing and keep shared new ideas….! Hope you’re on the mend! My family & friends in OH have all been sick, too. Then again, those of us in AZ have been, too! This is the perfect “medicine!” It looks delicious and so comforting! This soup looks fantastic! I am warming up just looking at it! I could go for a big bowl of this soup right now. It looks perfect! This soup looks absolutely fantastic! Perfect winter soup! This is warming me up just looking and thanking about it! Wishing I had that for lunch right about now. Homemade is always so much better! You did a great job! I find that soups which contain potatoes do not freeze well. The potatoes become spongy. What is your trick? Thanks!